On April 1st, at 18:47 EVE time, the system of Innia was conquered. Gallente Federation militia forces took the system after more than eight months of Caldari State control. To the uninitiated this may seem of little importance; in Factional Warfare systems are conquered and lost daily. Nothing could be further from the truth. Kills numbering in the hundreds of thousands and battles beyond count in Black Rise and Placid over that eight month period had earned the area the reputation for being the most violent area of all of New Eden. Before its demise Inna was the crown jewel of the Caldari. During early 2013 the system was bandied between the militias although the Gallente would only hold it for a few days at a time. On the 18th of July Caldari forces were able to establish the control that would be the genesis of Innia’s fortress status. Innia’s location makes it very tactically significant. The system links the north and south parts of the Black Rise portion of the war zone as well as having easy access to the heart of Placid. It is also situated a mere two jumps from Onnamon – providing a short and strong supply line to Caldari highsec. Its main drawback, as any Caldari that lived there will tell you, was its immense size and the travel distances that entailed. At its height Innia was the cradle of Caldari dominance. Being the staging system for many notable entities in the war, such as Templis CALSF, TEST Alliance Please Ignore and numerous others, it was a symbol of Caldari power and instrumental to their war effort. ‘You’ll never take Fortress Innia!’ was a common saying amongst the ‘Squids’. Indeed it was so well protected that even Gallente pilots tended to agree. However right next to Innia lies Eha – the gate to Placid. It is the legendary, long undefeated fortress system and forward staging base of the Gallente militia. I cannot resist the quip: One does not simply walk into Placid. This is very much a story of two towers. If one wanted a good vantage point from which to study this entire period, Eha would be a good place to do it. It was a bastion of resistance upon which the efforts of Ev0ke were broken and a defiant thorn in the side of TEST’s invasion of the war zone. Several ambitious campaigns to topple it were launched by the Caldari during the period, all of them failing. Eha is the forward staging system from which the final push to take Innia was launched. 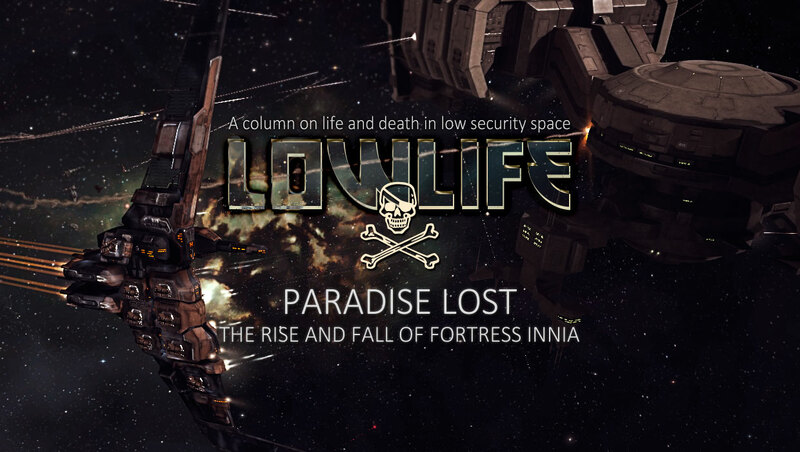 The fall of Innia starts with TEST leaving the scene in late 2013. They had been the life support of the Caldari militia during their stint in Factional Warfare, providing troops, supplying hardware and mobilizing fleets. Their exit removed a pillar upon which the Caldari had learned to rely, leaving a militia that was not structurally sound. It was not long before unrest broke out within the Caldari ranks. Morale was sapped by political infighting and grudges between militia leaders. As a result there was a lack of support between alliances, so when the Gallente marched on key systems some had to fend for themselves. The military setbacks that ensued led to a further schism on the political plane – deep rifts were torn in the fabric of the militia and its ability to function as a fighting force. Attempts to reinforce from the general, State Protectorate employed, militia were for naught as it was found wanting and riddled with farmers. The acidity of bad blood within the militia only got worse and resulted in the loss of prominent FCs as well as members. BORG, for instance, simply defected to the Gallente, after having awoxed a considerable fleet of their former brethren. All the while the situation was aggravated by regular Gallente disruptive operations in Innia. Gate camps in the surrounding systems and hit-and-run station raids were common, intended to harass and disrupt the daily life in the system. The blood in the water saw the attention of pirate and outlaw elements increase as well. A desperate campaign to take the key system of Oicx was launched. The system was behind the Eha ‘wall’ and would have provided an excellent base of operations for the Placid region, had it been held for a longer period of time. The fruit of these labours was short lived however; the Caldari only managed to hold the system for eleven short and brutal days, before it was back in Gallente hands. The Gallente militia, already known as one of the most efficient fighting forces in New Eden, went through the opposite process. Beaten into shape, rather than broken, by the efforts of Ev0ke, TEST, Templis, WAFFLES, BALEX and others, they were now sharpened by a singular vision. Unlike the Caldari, the ‘Frogs’ had a reliable bank of experienced FC’s that had learned to do more with less, standing throughout the period. The grunts on the ‘ground’, that made up the body of Gallente fighting forces, were similarly battle hardened and had many veterans in their ranks. Political ties between the significant alliances in the militia were similarly nurtured internally and hardened by fire externally. Active alliances in the militia freely intermingled to form efficient fleets, able to carry out strategies formed by a functioning leadership arrangement. The infrastructure of the Gallente war machine that finally set it sights on the crown jewel and pride of the Caldari militia was sturdy, well oiled and deadly efficient. As Caldari forces were pushed back towards Innia during early 2014 it became one the bloodiest solar systems in New Eden (currently standing at 28,000 kills for the year to date). It can be argued that Innia was lost long before it fell. Caldari forces were occupied with defending the system from guerilla attacks around the clock, while the rest of the war zone was dismantled around them. Some Caldari fell to despair and abandoned their watch, taxed heavily by the recent decline of their militia and the dissent which ran rampant in its ranks. Gallente operatives infiltrating the Caldari passed this intelligence on and Gallente strategic command set the scene for the final push. As the dust settled from the short and violent Caldari stint in Oicx, plans were being drawn. Gallente leadership consolidated the strategy and troops were set in motion during the last week of March. Plexing fleets began to apply relentless pressure on Innia, day and night. The decimated Caldari forces that tried to resist the invasion were outgunned and teetering on burnout as they were pushed to the limit. Dyed-in-the-wool pilots put in a heroic effort, sacrificing hours of sleep in a desperate attempt to defend their home against an unrelenting, merciless foe. The divides and low morale in militia made themselves known as the contested state rose. Instead of banding together and fighting, many fled the onslaught. Much of the needed ships and supplies had been lost in the ill-fated Oicx campaign and the pilots that attempted to defend the system found themselves running short on both supplies and reinforcements. The lack of functioning militia-level command meant that no coordinated effort of defensive plexing was launched. The final occupation forces that lay siege to Innia did so relentlessly and without rest for two full days. The last stand of the once mighty Fortress Inna was held in nothing more than a novice plex. The battle lasted for some time, with both sides re-shipping. Caldari forces were able to do so quickly where as the Gallente were forced to jump to Eha to do the same. This advantage only provided a temporary victory as Gallente FC’s consolidated their troops and were able to hold the field after a final assault. The Caldari made two later attempts to clear out plexes that were being run. Griffins and sensor dampeners were fielded alongside destroyers and frigates to counter the long range Cormorants of the Gallente. Efficient target calling and sheer firepower saw both attacks fail however. As it often is with EVE, what happened next was utterly unexpected and quite unique. 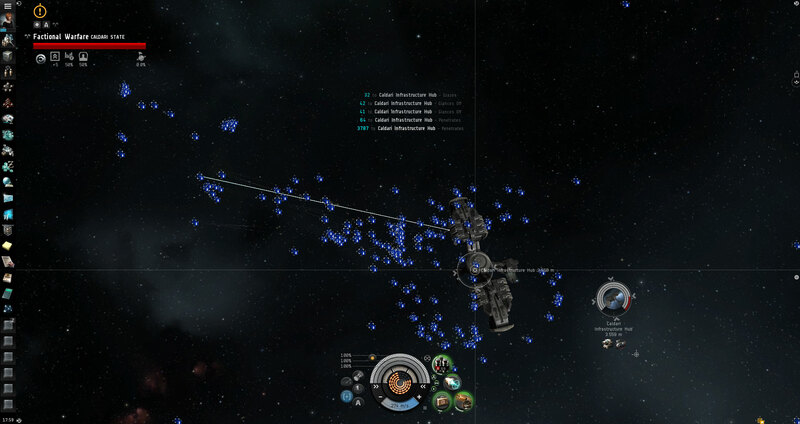 A 150-man Venture fleet arrived in system and engaged the Gallente invaders in a novice plex. If you are familiar with the Venture you will know that it is a mining frigate. These, however, were the fondly named Battle Ventures, fit for fighting! Battle Ventures are sometimes flown as a bit of fun, but 150 of them is a rare sight indeed. The mighty Battle Ventures were not allied with the Caldari and eventually moved on, after getting the fight they were looking for. Gallenteans went on to overplex the system by three plexes, ensuring that if the Caldari were to muster a plexing fleet of any kind there would be ample time to address the problem. Throughout the days of the invasion the Caldari were evacuating, selling what they could not take with them. When the infrastructure hub bashing fleet landed at its target on the afternoon of April 1st the system was nearly deserted – a sight several members of the Gallente fleet had never seen. Every DPS ship in the vicinity had been brought to bear. The considerable firepower fielded decimated the infrastructure hub in less than ten minutes. And thus, after eight months and twelve days of bloody war, Fortress Innia was defeated at last. This monolith of Caldari power that was ever present when Gallente militiamen spoke of the war amongst each other. The fortress that could not be taken, now laid to waste. As it has been predicted by military thinkers, the fall of Innia led to the widespread rout of Caldari forces throughout the war zone. Gallente command continue to press the advantage and more systems are taken daily. As things stand now there is nothing to oppose the Gallente war machine in any significant way. Many Gallenteans are weary of war however. A significant number have been fighting daily for months on end and now turn to restock their supplies and put their house in order. Others thirst for fighting still and pursue the pockets of Caldari resistance that remain, or seek to clash with pirates – something they often oblige. Meanwhile, amongst the Caldari, the fingerpointing continues. The loss of Innia is blamed on poor cooperation, defectors and awoxers. Although a few Caldari leaders admit that the Gallente executed their assault flawlessly, and that there was little they could do in the face of such determined ferocity. Some Caldari are putting away their uniforms, their will to fight broken. Others are choosing the life of outlaws. Meanwhile determined loyalists are attempting to relocate within the war zone and mount some form of resistance. In any case, Caldari leaders had some very hard choices to make as Innia fell. The slow summer season draws near and it is unlikely that we will see a Caldari offensive of any greater magnitude for some time. But, as they say, winter is coming. Many a Caldari vow vengeance in their bitter retreat. Acknowledgement: Although I was there in the fleet that pushed Innia to the brink, and very much a part of the campaign that lead up to it, I could not make it for the actual iHub assault. Thankfully my alliance mate in Villore Accords, CheesusCrust, was there and kindly reported to me the events that took place in the last two hours in great detail. Like a boss. Thank you CheesusCrust.